Discussion in 'Mac Blog Discussion' started by MacRumors, Jun 11, 2012. This 2880x1880 screenshot of Dashboard on a Retina-equipped MacBook Pro displays at full resolution on non-Retina equipped Macs. The image gives a decent idea of the sheer number of pixels on Apple's new flagship Mac. Wow! 2880 by 1880! That's amazing! Better resolution that a Thunderbolt display! Just wow! Question: Is this machine good enough to replace my 24" 2.4 GHz Al iMac? Or am I going to miss those 9" of desktop I'll lose? A very small and insignificant thing I noticed: the little dots on the background are pushed out. My dashboard background dots are pushed in. 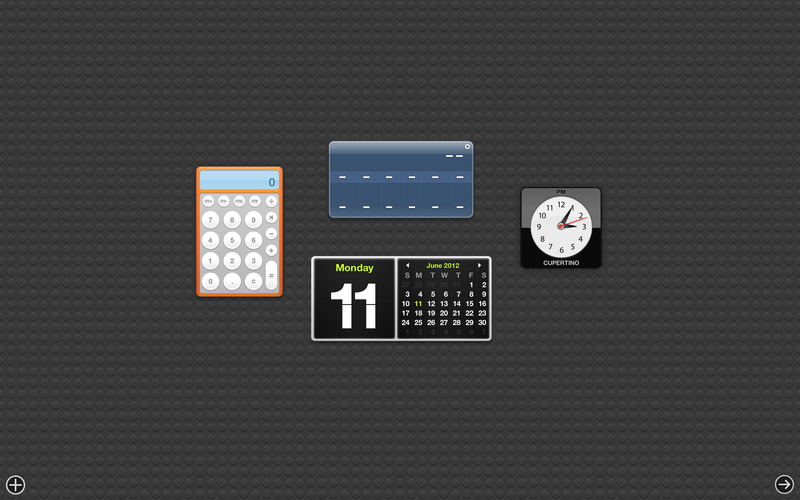 The widgets are so nice and clear though. It's amazing. This machine is actually faster than the small iMac, plus the fact that it has SSD standard makes it a really reactive system. The GPU is an improvement, while still being a mobile GPU, you won't be playing games at native resolution (but even top of the line single GPU cards would barely manage it), but for the rest it's fine. I want a retina iMac now!! Nice, but is it necessary? But seeing the meager update to the MacPro, the iMac upgrade might be a little beefier in order to offer an alternative to the pro line... Retina iMac? Anyone? Nice. However, I won't be getting a retina display capable computer until they release retina Cinema Displays - since getting my iPad I only use my MacBook Pro once a week for meetings. Does anyone know if there is anyway to disable the pixel doubling? I have great eyesight and my work requires a lot of desktop space. If I could use the existing applications at the full res it would greatly increase my productivity on laptops where I typically find it very difficult to work. I plan on buying one in the next few days, after deciding against an iMac -- which I was hoping would get to 4k+ -- but this would be a big influence in which I purchase. Ordered this guy today. Best case scenario it will be here in 9 days. Worst case is 13. BTO 2.6 512 16. Can't wait! This is going to be great for design and photography. Excited that CS6 and Coda 2 will support retina out of the gate. Same here. I will wait for a 27" retina display. Got mine too late. Already 7-10 days till shipping...arhhh if they come out in store I am gonna return the one I ordered online and buy from store!! Apps like video and photo editing should use 1:1 pixels by default (once they are Retina-enabled). For text, just choose a smaller font size for the editor/browser/terminal. About the only thing that cannot be easily un-doubled are UI elements like buttons and palettes. Aww thanks. You're beautiful too! I think it's going to be painful to design with unless it's print work. Web is going to be tough to get used to. That's fine and all, but I didn't say I needed a faster computer. Until SCII:HoTS or HL2:E3 come out and require a faster computer, I'm just fine with this one speed wise. What I'm asking about is the screen. How noticeable will it be if I swap out my iMac's 24" for this thing's 15"? I suspect that, pretty as it is, I'll definitely miss the real estate I'll lose. I enjoy having two Xcode projects + documentation + Safari with a bunch of tabs open all visible at once and not overlapping. This is doable without having the screen feel too cramped on my iMac. On this new MacBook Pro, I suspect it'll feel very cramped. I think you misunderstood my question. I want to use OLD apps - without Retina-enabled functionality - specifically for the advantage of having all of the ui elements at half the size and a very large desktop. These are not apple apps. Simply I just don't want apple to double the pixels for non retina enabled apps -- optionally of course as most people will want the pixels doubled. I want the buttons and interface tiny as if it were just a regular hi res screen. Once the are Retina-enabled the whole point is lost and the screen adds no functionality for my uses just aesthetic eye candy which I can do with out. I want the buttons and interface tiny as if it were just a regular hi res screen. No, I understood your question. There might be a developer/unofficial tool/hack to turn off HiDPI support, but I haven't heard of one yet. Give it a week.